Surgical procedures designed to repair hernias are performed in large numbers throughout the United States, with roughly a million such operations taking place annually. In many such procedures, surgical mesh is used in order to facilitate healing, but an increasing volume of patients have reported concerns with the Physiomesh product from Ethicon, which has been widely available in this country since 2010. Plaintiffs in litigation against the maker of the repair mesh have been seeking compensation for the side effects and injuries they argue were the direct result of having Physiomesh implanted in their bodies. 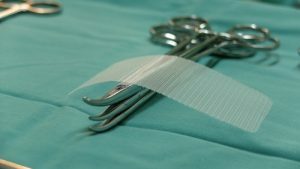 The purpose of surgical mesh is to provide additional support to tissues that have been weakened or even damaged during hernia repair operations. The mesh patches are made from flexible plastic fibers woven into a sort of fabric meant to halt adhesions within the body as the repair is allowed to take hold. Though many have touted the countless successful surgeries in which mesh of this type was used, a growing wave of patients has alleged that the product is capable of producing profound harm. Those who have raised concerns about Physiomesh patches have complained about a range of dangerous complications including recurrence of hernias, intestinal blockages, abscesses, tissue adhesions, infections, organ perforations, renal failure, chronic pain and the need for risky revision surgery. Following a review of data from European hernia repair surgical registries, Ethicon’s parent company Johnson & Johnson issued a voluntary removal of the product from the worldwide market. Those who believe they were seriously harmed due to the use of Physiomesh during hernia repair surgery are currently pursuing substantial compensation from Ethicon. Successful plaintiffs may be able to secure payment for medical bills, hospitalization expenses, lost wages, reduction in earning capacity, loss of marital relationships, pain, suffering and more. As more individuals make the connection between Physiomesh and the side effects they experienced, the tide of litigation is only expected to grow. However, doing battle with a medical device manufacturer is never a simple process, and the help of a seasoned Physiomesh lawsuit attorney is critical in boosting a plaintiff’s chances of recovery. A skilled products liability and defective medical product lawyer with Alonso Krangle LLP will review the facts of each prospective client’s case and provide the insights necessary for them to make informed decisions about their future. Contact Alonso Krangle LLP today. We fight for victims!